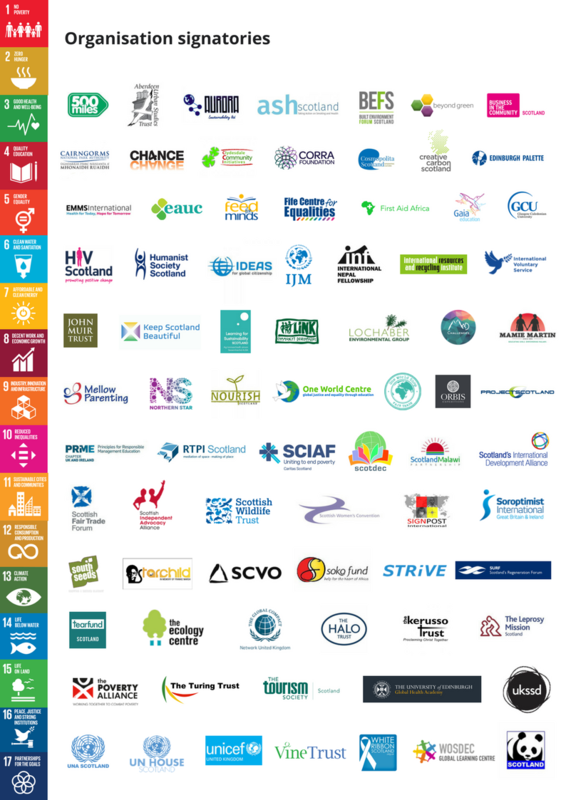 Over 80 organisations and 250 individuals working on the Sustainable Development Goals in Scotland have signed our open letter to Scottish Political Parties, Parliamentary Committees, the Scottish Cabinet, Scotland's Secretary of State and all 32 Local Authorities. 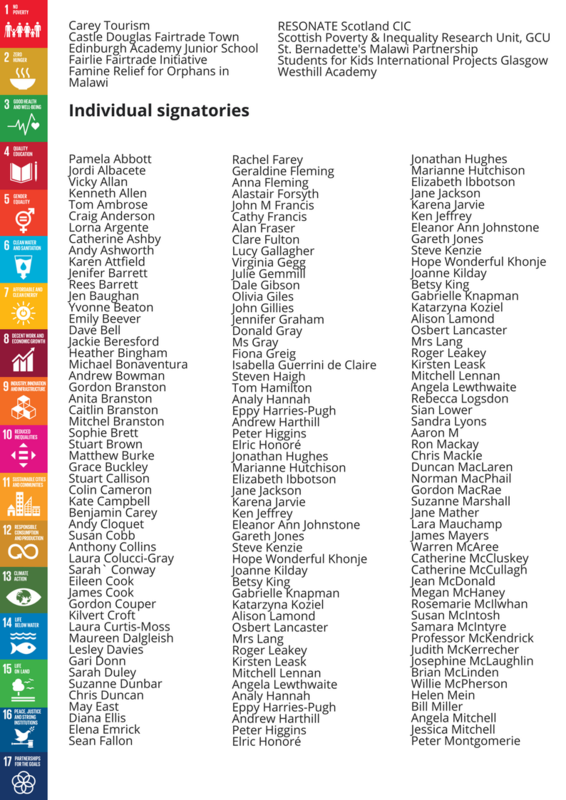 The letter calls on these key decision makers and institutions to show their commitment to delivering the UN Sustainable Development Goals in Scotland by publishing the specific actions they are taking that relate to the 17 critical areas reflected in the SDGs. In January 2016, Scotland adopted the UN Sustainable Development Goals, also known as the Global Goals. Since then, citizens, civil society organisations, business leaders and politicians across the country have tasked themselves to see that we achieved these goals both in Scotland and across the world. 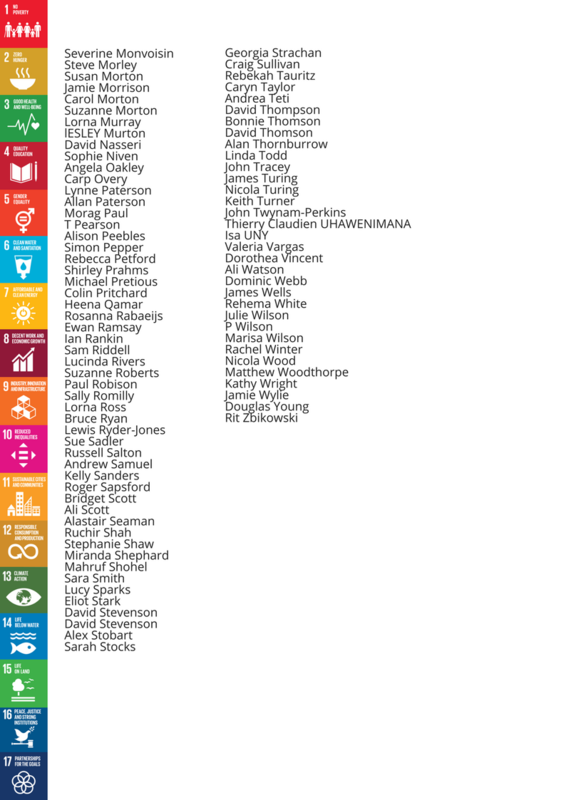 Scotland’s SDG Network is a coalition of people and civil society organisations committed to pursuing the SDGs and building awareness and engagement across Scottish society. The purpose of this letter is to raise awareness of the SDGs at key strategic levels, encourage a sense of responsibility from institutions and key individuals and to map out where existing activity is taking place and track progress over the coming years. We will publish all responses in May 2018 in a report on this website. The purpose of collating this information is to inform the direction of activities in Scotland relating to the SDGs two years on since they were adopted in Scotland. Ahead of this time, we have asked all recipients of the letter to send their responses no later than April 2018 to globalgoals@scvo.org.uk. The SDGs are the closest the world has come to a plan to end extreme poverty, tackle inequalities and combat climate change, and Scotland was one of the first countries in the world to sign up in 2015. Now entering our third year of action, this letter presents an opening for civil society, business and government to come together to make sure that actions are taken in Scotland to see that the SDGs are achieved. Our organisation is the membership body for everyone committed to creating a fairer world, free from poverty, injustice and environmental threats. As such, we fully endorse the Sustainable Development Goals and align our objectives to the international commitment to meet them. Importantly, achieving the ambitious SDGs is only possible if there is buy in and commitment everywhere, including here in Scotland. We also recognise that decisions at any level of government here in Scotland or elsewhere can have implications across the globe. 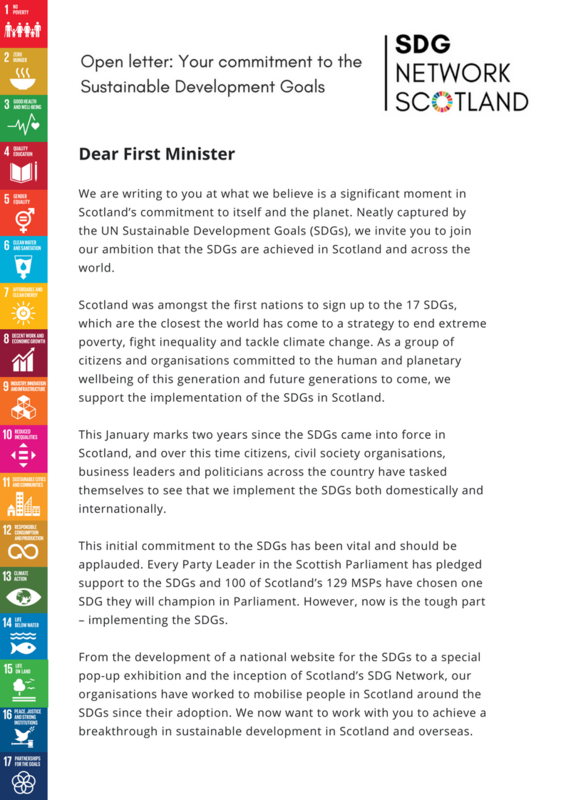 We were therefore happy to sign the open letter by Scotland’s SDG Network, and look forward to decision makers across the country publicly committing to the SDGs in the coming weeks. 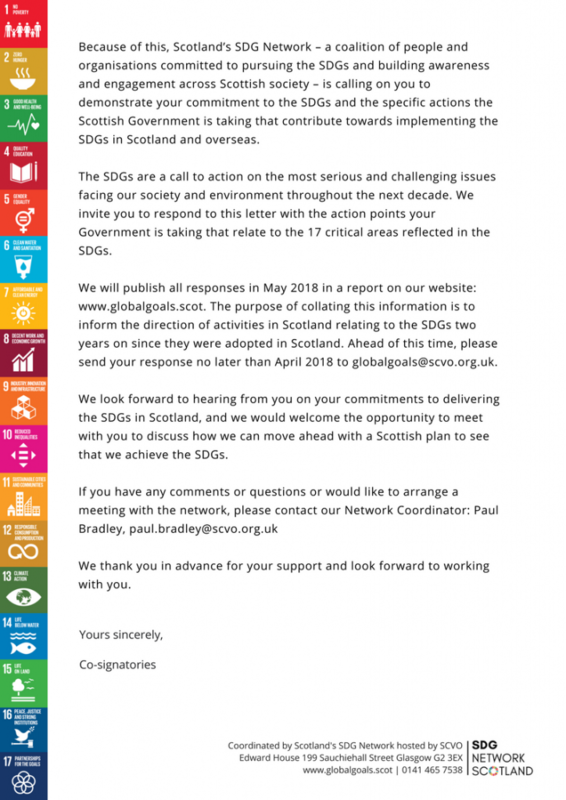 Glasgow Caledonian University signed the SDG Network’s open letter because we feel the SDGs provide a powerful framework for collaborative action to tackle some of society’s most pressing challenges. At the university, we have ensured that the SDGS form the foundation of our Research Strategy. Across the university, from fair fashion to access to health we are using our applied research to work across disciplines and sectors to promote sustainability and social impact. The SDGs are the world’s roadmap towards a fairer and more sustainable future. They will only be realised through collaboration between business, government and civic society to solve the pressing problems of our time. The SDGs sit at the heart of our strategy and are central to the pursuit of a truly inclusive and sustainable Scotland.